There’s more information, including the table of contents for the book, on the edited collections page of my website. Extinction Studies collects haunting and haunted multivoiced stories that echo together in a vibrant plea for an ethic of care, lucidity, and obstinate, stammering hope. We need such stories to make us feel and think with the unraveling of a world we inherit and share together with innumerable entangled forms and ways of life. We need them also to repopulate our devastated imaginations and to help us escape the twin easy temptations of nihilist despair and blind confidence. This extraordinary collection addresses one of the most sobering aspects of the current environmental crisis. The contributing scholars use narrative as the vehicle for their historical, ethnographic, zoological, meditative, and poetic insights. The result is both personal and scholarly, both illuminating and a pleasure to read. 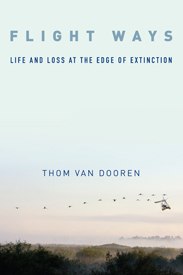 Extinction Studies makes an important contribution to human-animal studies and the environmental humanities as the volume explores what extinctions and recoveries of endangered animal species mean in different cultural contexts. These perceptive and wide-ranging essays focus on the narrative and philosophical frameworks that turn the ecological reduction of bioabundance and biodiversity into sources of reflection about human and more-than-human ways of life as they unfold across generations and evolutionary ages. These analyses and meditations acknowledge both that animals can never be fully assimilated to human understanding, and that human stories play a crucial role in shaping the bonds with animals that take multispecies communities into a future of danger, but also of hope and exuberance. Human-caused extinction challenges our own survival—but also our compassion and our ability to tell stories adequate to shifting configurations of ‘us’ and ‘them.’ This volume gathers seven fine storytellers who show us what it means to lose or save another animal species in an era of rapid extinctions. These are tales of passion, time, conflict, learning, slaughter, imprisonment, and prayer. Drawing upon their common membership in an interdisciplinary and international working group on extinction studies, the authors show the potential of the environmental humanities to address one of the major crises of our moment in history. The studies contained in this volume cross species and kingdom boundaries, and are full of hope just as much as grief and mourning. In bearing witness to the lives of species that are functionally and/or already extinct, the authors present multiple modes of response and responsibility for those of us who remain.